CHARLES CITY, Va. - President Bush told Americans yesterday that they should commemorate the nation's Thanksgiving Day holiday by expressing gratitude to those who "serve in a cause larger than themselves" and by aiding the less fortunate. 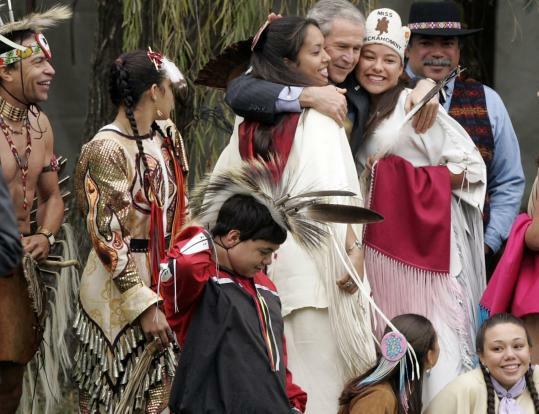 "As we count our many blessings, I encourage all Americans to show their thanks by giving back," Bush said at Berkeley Plantation in Charles City, Va., in the first Thanksgiving-themed speech of his presidency. The president cited the opportunities available in the United States, extolled the gifts of freedom and democracy, and offered praise to farmers, teachers, soldiers, police officers, and others who contribute to the greater good. He gave particular attention to members of the armed forces, who are engaged in conflicts in Afghanistan and Iraq. To those who have lost a family member in those wars, Bush said, "We vow that their sacrifice will not be in vain." Since the Civil War, the United States has celebrated the Thanksgiving holiday on the fourth Thursday in November. This year it falls on Nov. 22. Many Americans regard the first Thanksgiving as the celebration of a successful harvest in Plymouth, Mass., in the autumn of 1621. The first official celebration actually occurred on Dec. 4, 1619, according to the White House. That's when Captain John Woodlief led 37 newly arrived English colonists to a grassy slope along the James River now known as Berkeley Plantation. He instructed them to drop to their knees and give thanks for a safe arrival to the New World. Bush noted that the Plantation, between Richmond and Williamsburg, lays claim to having held Thanksgiving "before the Pilgrims even left port. As you can imagine, this version of events isn't popular up north." Berkeley, which is on the National Register of Historic Places, is a 1,000-acre estate that hosts a Thanksgiving festival annually. A 1726 Georgian-style mansion on the grounds is the birthplace of William Henry Harrison, the nation's ninth president, who gave a two-hour inaugural speech there on a cold, rainy day, caught pneumonia, and died a month later. The plantation is also the ancestral home of Benjamin Harrison, the 23d president. "We remember that the settlers at Berkeley came to America with the hope of building a better life," Bush said. "And we remember that immigrants in every generation have followed in their footsteps." Bush spoke to about 500 invited guests, including state and local officeholders and a future in-law, a former lieutenant governor of Virginia, John H. Hager. He is the father of Henry Hager, who is engaged to Bush's daughter Jenna. Before his speech, Bush met with volunteers at the Central Virginia Food Bank in Richmond, established in 1980 by local churches and charities concerned about the growing hunger and poverty in the 31 counties and five cities its serves. At the one-story brick warehouse, the president helped load boxes of fresh oranges, potatoes, and macaroni and cheese for distribution to the needy. The organization serves about 101,000 per month, according to Faye Lohr, the food bank's chief executive officer. "I thank you for what you are doing," Bush told Lohr. The agency, with a budget of $20.8 million, distributed almost 13 million pounds of food last year, up 12 percent from the previous year. It serves children, the homeless, the elderly, the working poor, the disabled, battered women, the newly unemployed, victims of natural disasters, the mentally ill, and single-parent families, according to its website. Donations came from schools, churches, individuals, and food companies such as Perdue Farms, Supervalu Inc., Wal-Mart Stores, ConAgra Foundation, Kellogg Co., and Procter & Gamble Co., among others. Bush, in an annual tradition, today will pardon a Thanksgiving Day turkey in the Rose Garden at the White House before he and Laura Bush leave for Camp David to spend the long holiday weekend. They return to the White House on Sunday.